There are more than 10,000 species of fern, varying in height from a few millimeters to several meters. 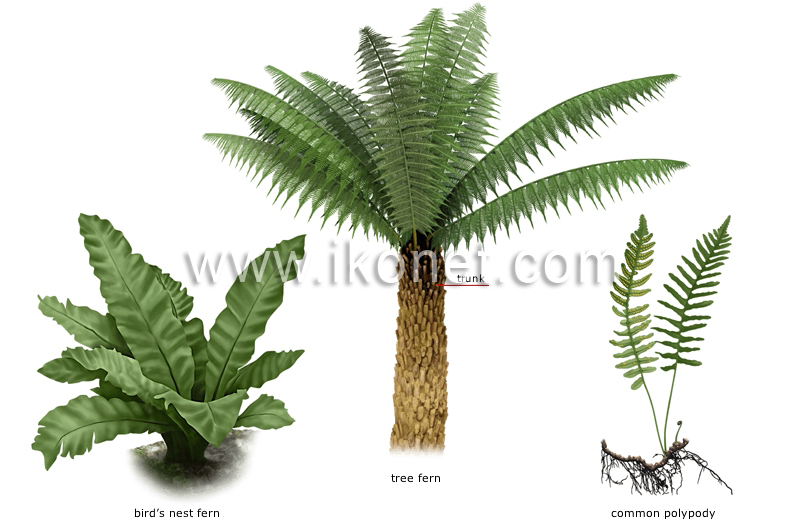 Large fern that resembles a tree and can reach heights of up to 20 m; it grows mainly in the tropics. Main part of the fern, composed of a vertical rhizome covered with the stubs of old fronds and, often, with aboveground adventitious roots. Fern that usually grows out of another plant without deriving nourishment from it; its fronds grow in a rosette around a central rhizome, hence its name. Fern with fronds up to 30 cm long; it is usually found in damp overgrown soil, on rocks or tree trunks.